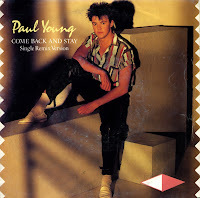 Paul Young's 1983 hit single 'Come back and stay' was written by American musician Jack Lee. The song may have been written about one of his two teen sweethearts (with whom he fathered respectively a son and a daughter) or to his wife and mother of his two youngest daughters. This theme of loss of love, heartbreak and abandonment was derived from his life experiences that kept repeating. Paul Young reached number 4 in the UK singles chart and number 2 in the Dutch Top 40 with this track. The album version, which lasted for seven minutes, was edited to a 4'23 minute single remix version.